Well, if it isn’t a pink phone! (It is a pink phone). A chunky feature phone with a slide-out QWERTY keyboard, the VM202 from Alcatel is not exactly going to trouble the iPhone, but it does look like a decent sturdy mid-range handset. Alcatel is a French-Chinese company which aims to produce phones for all over the world, probably a company to watch given their foothold in the world’s fastest-growing consumer market. On a pay as you go deal exclusively with Virgin (for the first month) this is pretty cheap. It has internet connectivity with Facebook and Twitter Widgets. The browser is the speedy Opera Mini. The VM202 also has a 4megapixel camera which shoots video. One key asset is the large storage space afforded by the handset. Virgin are packing a 8gb micro-Sim card in with the phone. Details of Virgin’s Pay as you go deals can be found here. They include unlimited internet for 30p a day. 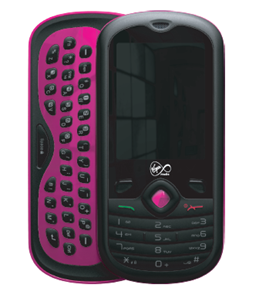 The VM202 handset will be available from Virgin Media stores and online at www.virginmedia.com for £39.99 including 300 free texts when bought with £10 airtime on pay-as-you-go. i like the phone but am having a problem with the storage.i uses 2mg memory card but when ever am trying to move or send anything to the card it not working why bcos no option on setting for storage.nd the phone memory is just 3mb.pls what do i do. The VoIP phone service is portable. You can carry your phone around even when you are travelling. All you require is a high speed internet link. i didnt think it was very good at first i thought it was a bit old fashioned as i wanted a blackberry but had to get this instead but as i learned more about it and got to use it more i liked it more. Its fine and has all the stuff that you get on any other high tech phone, gthe colour is nice and you cant go wrong with unlimited internet a day for 30p!